How can we help you with ZOHO? It’s not just about the technology. It’s about helping businesses transform. Migrating from ACT!, Highrise, Salesforce or other CRM or importing a list from other sources. Free options, cheat sheets for training, free customization, Expert Help to get you going. Zoho CRM or other Zoho Apps. As Zoho ONE Certified consultants, we know the Zoho product line. 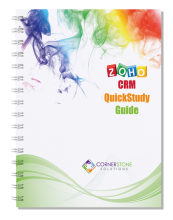 Really, we have the only Zoho CRM book on the market (sold on Amazon and on our site). We are constantly working to keep it updated…which means, we know everything there is to know about Zoho. You could spend all of your time viewing YouTube videos or searching online for how to do something. Stop beating your head against the computer screen. Not only do we know the answer, but we can help you with the why. Questions like: Why do it this way? Why fill in these fields? Why pick this dialog box option over that one? Why should you use Zoho Campaigns instead of something like Constant Contact? Which Zoho app should you use to record time sheets (there are three apps in Zoho that do that) and why is one better for your company than another? What is the difference between Zoho Survey and Zoho Forms? We know these kinds of things. We’ve been working with CRM databases since 1987. We’ve worked with literally thousands of clients to help them get the most out of their CRM and would be glad to help you with getting the most out of Zoho CRM for your company. We’ll give you a head start. 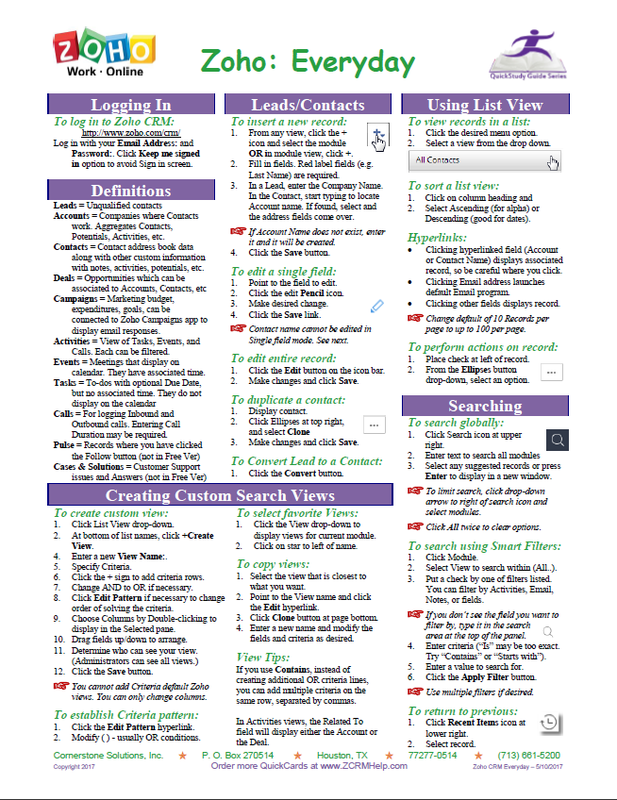 How about a copy of this handy, double-sided Zoho CRM Quick Reference Card for your own use or for training your end-users. Let us know who you are and the system will email you a copy right away. How hard is ZOHO to set up? The free version allows for up to 3 users (forever). However the feature set is limited (no email integration, no custom fields, custom reports, workflows, etc). If you need more users or more capability, it is easy and quick to upgrade. With the paid version you can start to customize to your company’s needs. The customization is not hard (it’s not rocket science) and Zoho offers you lots of options on how to set it up. You can watch YouTube videos or read my book (see above), but at some point, it is not about the technical steps, but about best business practices. And that is where we excel. We can help you understand the Why in choosing options in Zoho. We can take your company strategies and build workflows to automate your processes. We can help you take advantage of all of that Zoho has to offer, helping you to get the most out of your Zoho investment. Out goal is to help you define a system that supports the way that you like to do business, get setup quickly, and in a way that makes it easy for your team to use. We’ll give you a head start with some free customizations. Click here to find out more. It’s our way of showing you ways that we might work with you to get the designs that work for you. Cornerstone was founded on the simple observation that the world was changing and the changes were reflecting how sales teams needed to access their data, file reports, etc. Companies everywhere (including us) have been rethinking their playbook on how to meet those needs. Much of the software in the market has just not kept up. To that end, we setup and currently maintain our own Zoho environment (CRM, Books, Campaigns, Forms, Sign, etc) like an everyday laboratory to see what works and what doesn’t. What we have found is that Zoho pulls together all of the tools that a small to medium-sized company would need to manage their company. It is an all in one solution that allowed us to transform our business and we would love to help you get in the game as well. Cornerstone Solutions, Inc. was founded in 1987 as a software training company, and we are now one of the nation’s leading implementers of the Zoho suite of products. We work with solopreneur clients, as well as those that have over 500 users. Now you can have access to the top Zoho Certified Consultants in the world regardless of where you live. Call us (713-661-5200) and we can provide help in person, by phone, or by remote control of your computer to help you setup, convert, design, integrate and train… to make sure you are getting the most return on your investment in Zoho. Really, you should take advantage of all that experience in working with all of those companies. If you are doing something that is working for you, keep doing it. But if not, we’d love to help you explore your options. And if you need more help getting started, we have other options for you. Just setup an initial appointment on my calendar to find out how a Consultant could help you get up and running even faster. The world is changing at a fast pace. More and more companies are realizing the benefits of moving their sales team and company to the cloud and relying less on expensive internal servers. The cloud offers instant (yet secure) access to important files when away from the office. Road warriors enjoy easier access to client information and reporting of activities. Note the stats indicating the rise of portable devices and away from the standard MS workstation and laptop. We can certainly tell you how to do something, but we find that it works best with our clients if you tell us what problems/issues you are dealing with or trying to solve. Then we can help you formulate a plan for how to best accomplish that in the Zoho world. See the 5-step process that we use by clicking on each element below. Our obsession is understanding the why of your business and transforming that into a system in Zoho that supports your corporate sales and marketing strategies, while making it streamlined and easy enough to encourage end-user adoption. We start each project with a discovery meeting, which usually lasts between 1 and 3 hours (though for more complicated projects, they may run longer). Regardless of where you are located, we can meet with you and/or multiple staff members via online meeting software and a conference line. We will talk about your strategies and goals, things that have been working and those not working. Will you want to use Deals? Create Quotes from Zoho? Integrate other products? Build reports on activity? If you are using spreadsheets in your business, it helps us to see them prior to our meeting. Our goal will be to develop a system for your business that increases the odds of success and to develop a system that makes the lives of you and your teams much easier and more productive. Anyone can add a field. Really, it’s not rocket science. But we have years of experience in knowing what works and what doesn’t. After our initial discussions, we can help you design the perfect CRM system that supports your goals and processes. 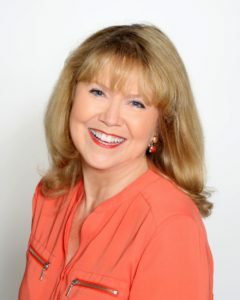 We can create the correct types of custom fields to segment your business, set up the custom modules to track any non-standard items, design layouts that are organized and clean without any unnecessary fields, build email templates to create quick responses or promote your business, add workflows to automate your business and create the reports and dashboards to help monitor your business. We can setup your users and define an effective system of security to control who sees what or who can do what. We can handle it all for you or work in collaboration with you. Whether you are converting from another CRM, importing your data from Outlook or a spreadsheet or bringing over your data from your accounting system, we can help you get your data into your new custom-designed Zoho CRM database. We’ve successfully converted from Salesforce.com, Highrise, Insightly, Hubspot, MS CRM, Goldmine and several others. We have a particular specialty in converting data from ACT!. We’ve been able to convert everything to Zoho: Contacts, Companies, Opportunities, Notes/History, and Activities. We’ve also been able to migrate a high percentage of associated Attachments. When familiar data has already been added to the database, it significantly improves end-user adoption. Zoho has a suite of over 40 native products that can be used to run your business. While the integration among the products is somewhat straightforward, there are conditions to setup each of the connections. We can help with that. We can assist you with setup and/or learning any of the other Zoho Products as well. We know them all. Really, we are Zoho ONE Certified. Have a problem you want to solve? Let us know and we can suggest what might work for you. Since Zoho is now one of the most popular online CRMs, there are also a ton other products that can be integrated. That way you can keep using what works well for you while maximizing your use of Zoho. We offer group or individual training that is very user friendly . We use your custom-designed database for our online training sessions and they are usually less than two hours. We can cover both web and mobile apps during our session. While we cover keystrokes, our focus is on training that reinforces the goals that we set out in our initial discovery session. We can also provide in-depth training for your administrators to help you be more self-sufficient. Short follow-up training sessions are recommended to help your team really get up to speed. Zoho Certified Consultant, Cornerstone Solutions, Inc.
– Michael James – CEO – James Environmental Management Inc.
“For several years I have made use of the Zoholics presentations given by Susan Clark and found them very instructive and enjoyable to watch. Also the ‘tips and tricks’ emails that she sends out have been useful starting points for Zoho beginners. However what most deserves my praise, thanks and admiration is the way she responded to an email cry for help on a problem which, despite forum posts and Zoho support emails, still remained unsolved. Even a Zoho connect session couldn’t solve the problem. Within a few days of my initial request I had a solution and, most important, a personally recorded video showing the steps I needed to take to solve the problem. Fantastic! “I recently decided to convert my ancient ACT! contact management system into Zoho. The good folks at Zoho were kind enough to introduce me to Susan, who handled the migration in a snap. As a former Systems Engineer, I’ve seen my share of file migrations, and this one was superbly handled.